Capturing engagement photos and portraits in dramatic locations is one of my favorite things to do, and Vasquez Rocks is absolutely one of the most interesting locations in Los Angeles for pre-wedding shoots. Vasquez Rocks is located about 50 miles north of Los Angeles, a few miles off the 14 Antelope Valley Freeway. This location involves climbing and is often wildly windy, but the stunning natural rock formations and desert brush help photographers create some truly beautiful imagery. Recognizing light patterns is one of the keys to outstanding photography, but it isn't enough to just be able to read light. A great photographer will always know what those light patterns can turn into during post-production. For this image of an engaged couple, my lighting assistant and I braved 45-mile-per-hour winds to be able to capture some truly stunning imagery. Expert use of off-camera lighting coupled with highly technical Photoshop work helped bring this photo alive. 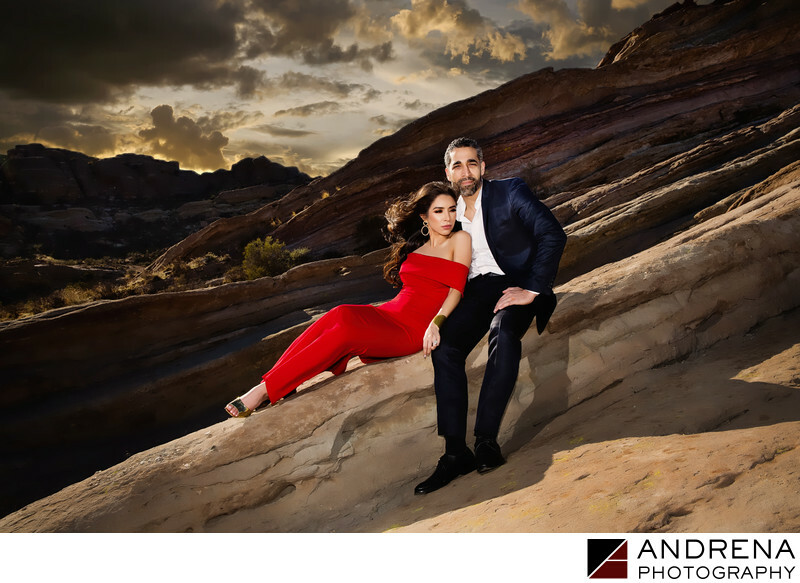 I also recommended that the bride wear a red dress so she would truly stand out from the desert color palette and base tons of Vasquez Rocks.